for me i used quick load to come up with a max load that is the 4th set in each string, then the last one is .3 over, i was doing .5 grain steps because i wanted to find max and gather data. 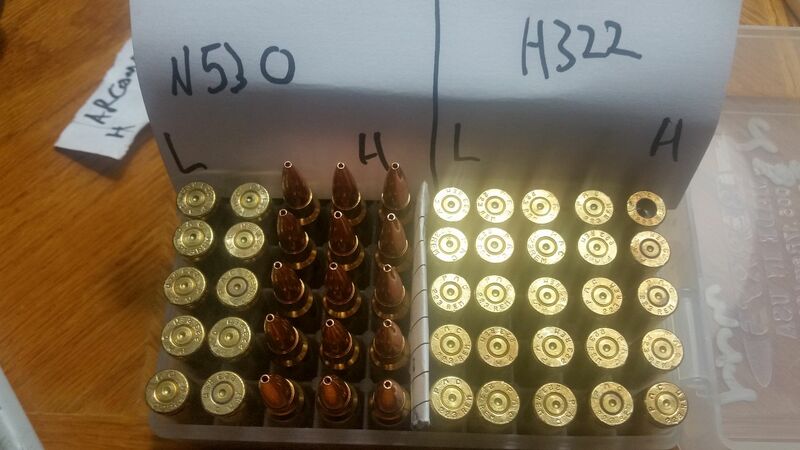 for the most part quickload was pretty close. the 4th set was max on most and as you can see lost a few primers. the gun is shooting well was ejecting perfectly with bolt lockback on all rounds fired. need to redo the n530 test because i started too high. 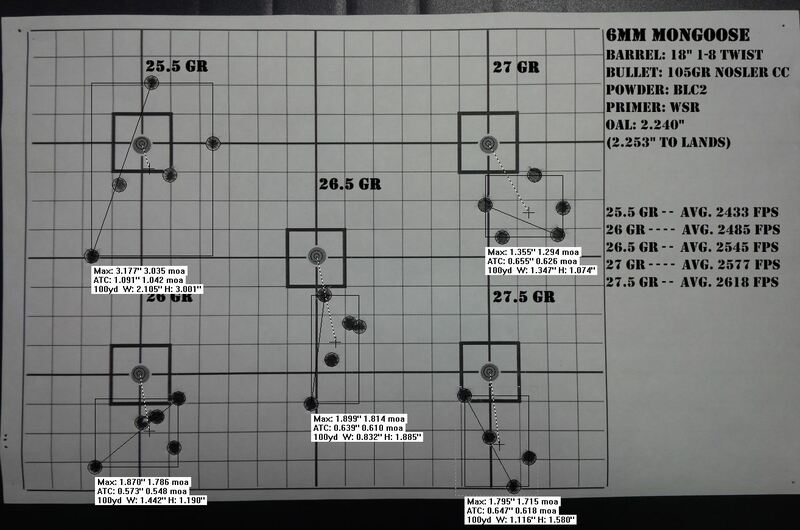 Some data with the 70grTNT through my 18" 1-8 twist barrel using IMR8208 and Benchmark (added to the "data sheet"). 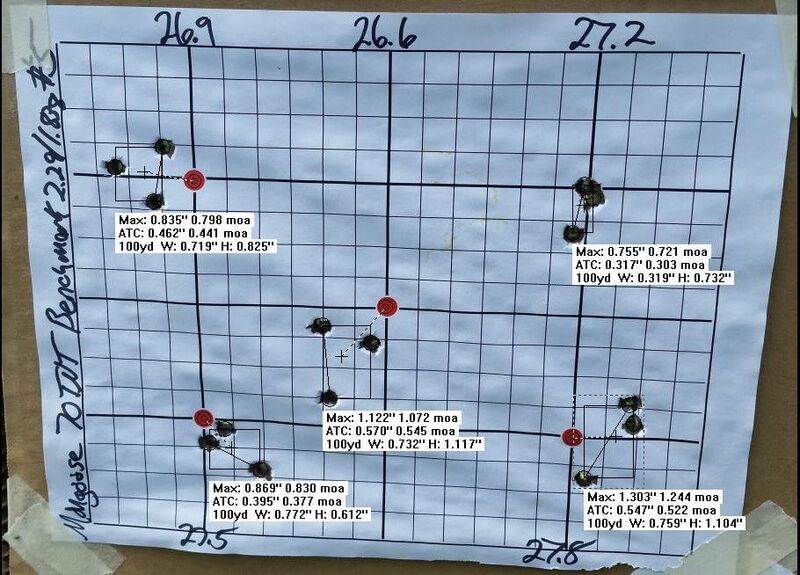 I'm currently using the 70grTNT with 27gr of Benchmark and CCI SRP BR-4 primers as one of my pet loads for shooting 100 yard 6X5 target challenges (see target below) and will try them soon at 300 yards. 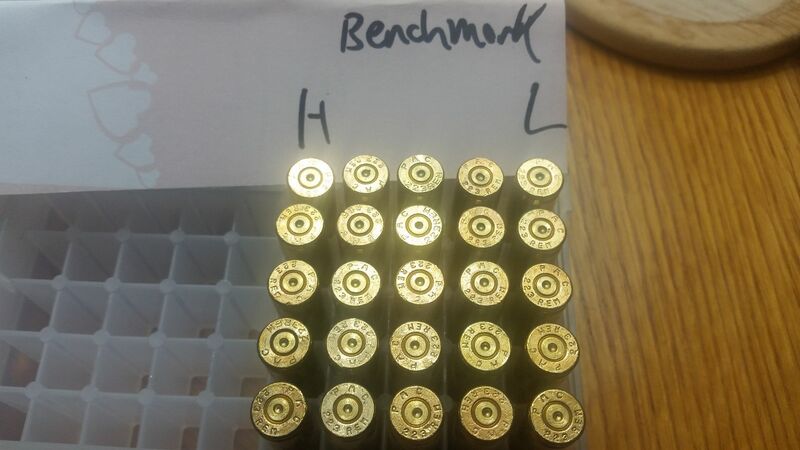 70grTNT with 27gr of Benchmark and CCI SRP BR-4 primers. 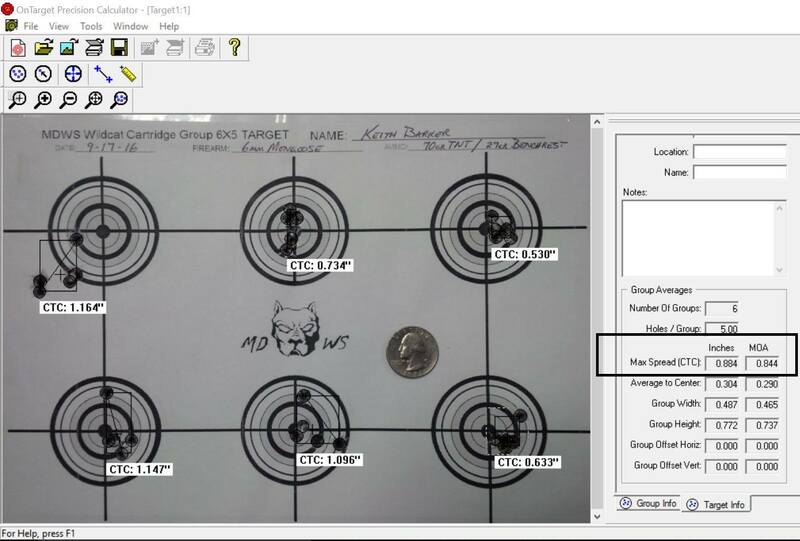 Firearms Instructor Certification and Metallic Cartridge Reloading Instructor. Background in Gunsmithing/Armorer, and Shooting Range Development and Management. I have a few lbs of Benchmark and a few hundred 70TNT.From Big Dawg's and kdBarker's load info. this seems like good combo.I'll start at 26.0grs and set up.Once it's running good and broke in I plan to try Benchmark with some 80TTSX's.I have a all the parts MDWS upper and a billet lower,CTC trigger or 2 stage Geiselle,and a carbon fiber hand guard.A 18" 1-9 and 6mm Mongoose door cover,dies and etc. coming. 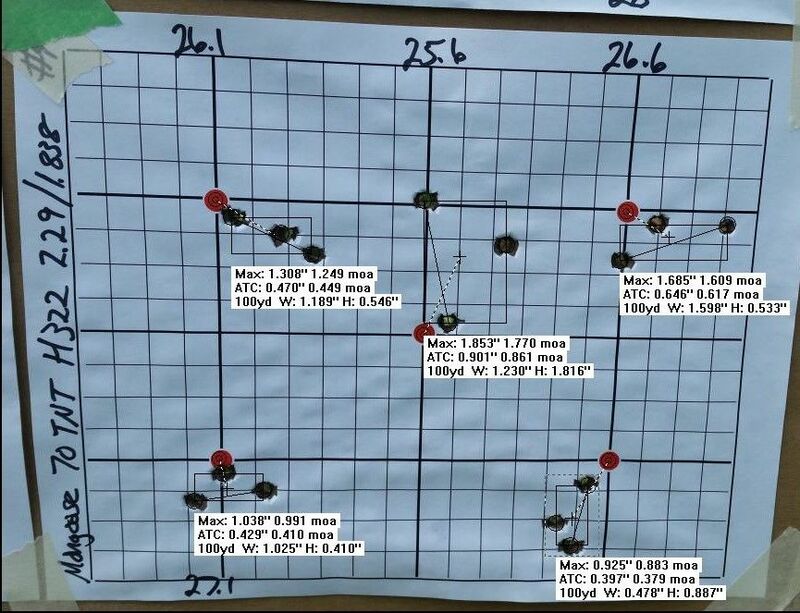 Has any one tried Benchmark with 80 TTSX's?I hope to get a load with the 70 TNT @ around 2,950fps (where kdBarker is running out of his 18")and if I can get a 80TTSX load accurate around 2,800fps,they would be very close to the same trajectory well past my hunting range.Mag swap from varmints/targets to deer/ hogs,perfect. I dont think anyone has tried benchmark with thr 80ttsx. It will be a good powder for them for sure. You wont have any trouble reaching 2800 with them. I ran them over 3000 from a 20" barrel with 335. 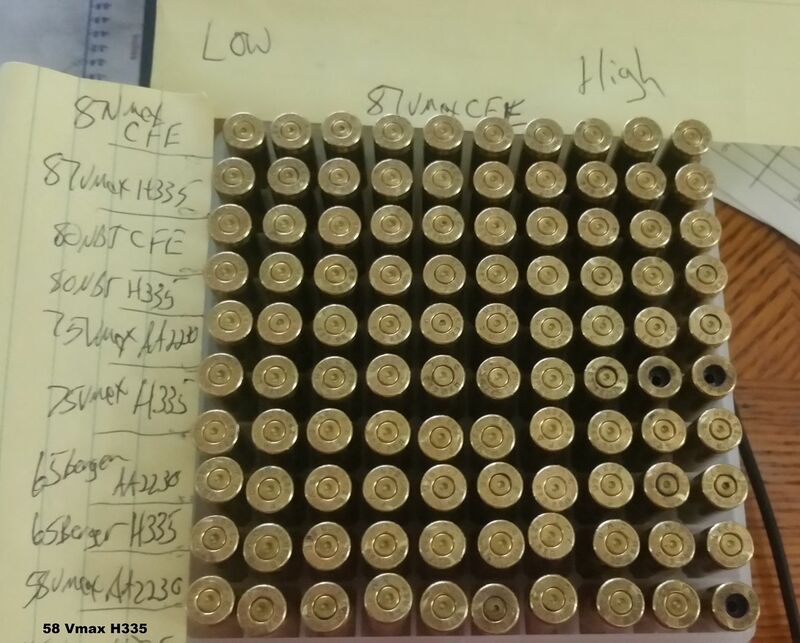 The 80ttsx is one of the bullets that the chamber was designed around. Thanks JW.Would I be better off using H335?I have both. I believe Benchmark will be better for accuracy, 335 better for speed. I like them both. Test them and decide which you like the best. Tough choices. 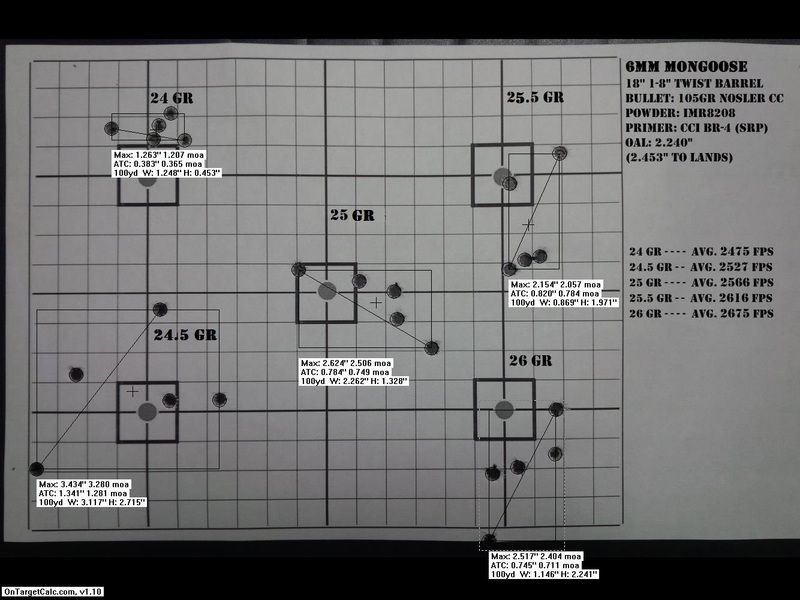 Some data with the 105gr Nosler Custom Comp through my 18" 1-8 twist barrel using IMR8208 (added to the "data sheet"). Going to work my way back to the lighter bullets. 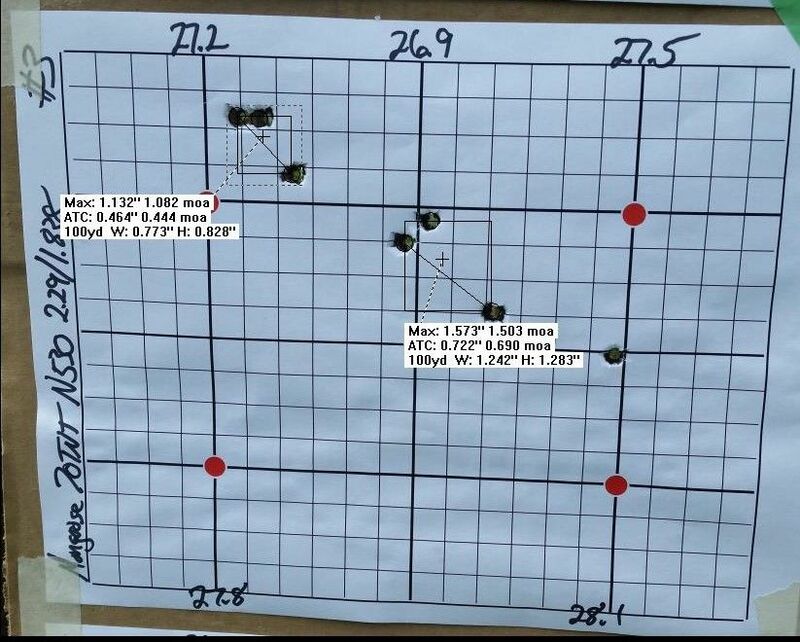 My little 18" barrel seems to like the 55gr-85gr. 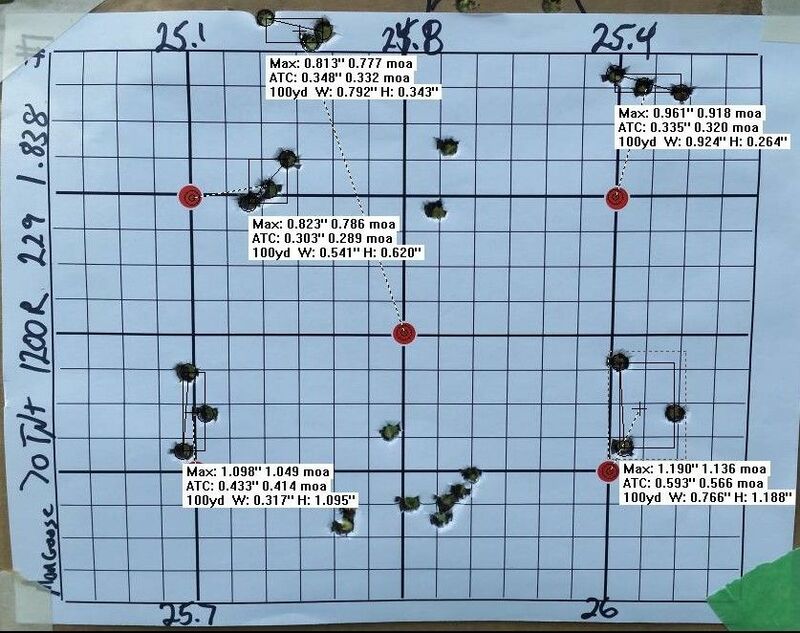 It seems like as soon as I try to go 95gr or above my accuracy suffers. Anyone try Leverevolution for this? I thought I saw people loading it for the 223. I know it's optimized for the 30-30 but it's got a few off-label uses that seen pretty decent, and IIRC, it's fairly temperature insensitive. 20" SS bbl. 8T ALL LC brass. Only loads that didn't have FTF issues along with the blc2 70 Nos VG. Still have to work on gun dealing with that issue. MAX LOADS ARE FOR THIS BBL YMMV. Now to get this FTF issues fixed. I had some feeding issues early on in load development. I found that my best reliability came from SS ASC magazines and Magpul M3s. 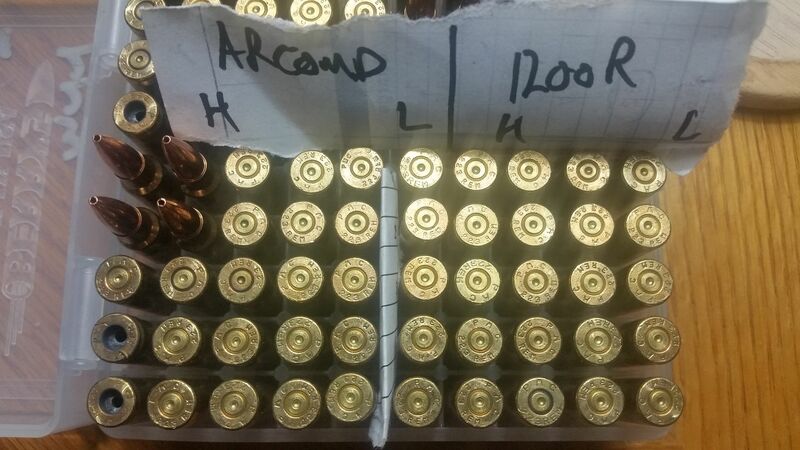 (Virgin loadings only) I experienced some malfunctions using Gen 2 Pmags and have since discontinued using them for fireforming brass. Using M3s and the ASC SS mags I have not had any feeding concerns. Thank you for posting your results. I used a hex mag on this trip and had terrible results. Will try something else on next range visit in a day or two and see how it goes. Thanks for the input Riggs68. If you find yourself in a fair fight you didn't plan your mission properly! What was the root cause of your FTF issue? Additionally, what are the COALs used in the above loadings? Red: This data is likely embedded somewhere above, but could be helpful to have in one post... what size did you open the port to? I think you're working with a 20" AR barrel 1:8 twist and mid-length gas system? Thanks! I thought the 20" was rifle length? I think thats what mine is. Will try again with warmer weather. Not a speed demon. 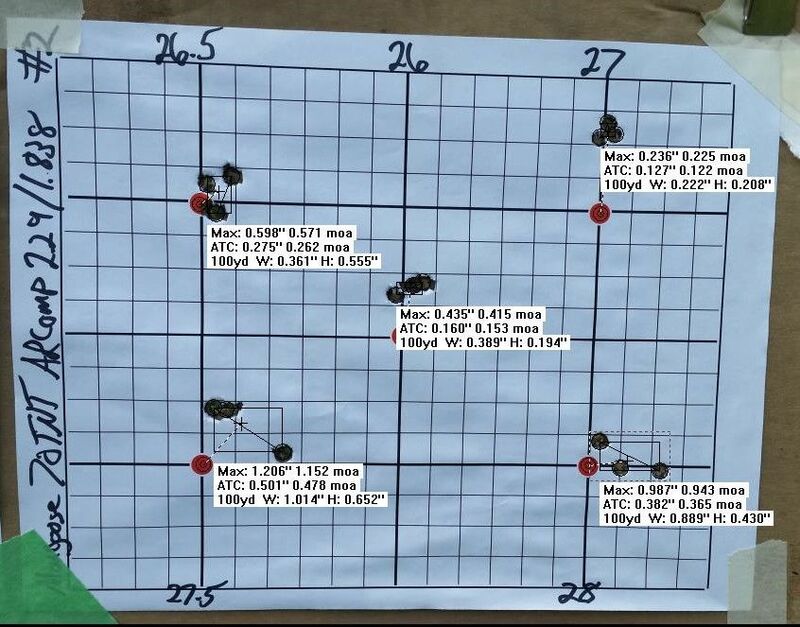 Best group was 27.5. 3 touching.